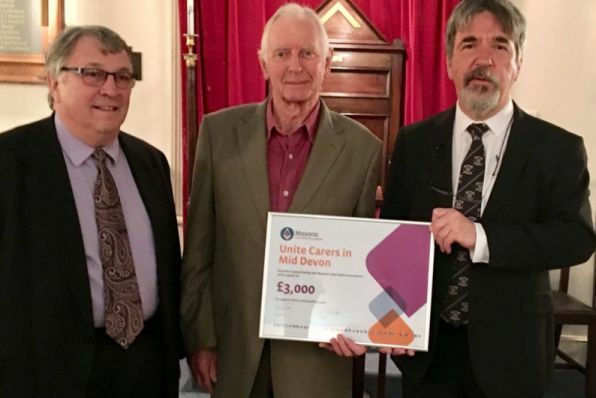 A charity which supports for unpaid carers, young and old, across Mid Devon have been presented with a £3000 donation. Ian Kingsbury JP. Provincial Grand Master of Devonshire together with Dr. Reuben Ayres Provincial Grand Charity Steward invited Roy Grantham chair of trustees for Unite- Carers in Mid Devon to meet them in the Masonic Hall at Uffculme to make a presentation of a certificate celebrating the grant of £3000 made to them by the Masonic Charitable Foundation (MCF) when they heard of the superb work undertaken by the charity. 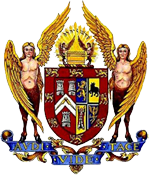 “Unite – Carers in Mid Devon” are a charity based in Tiverton which started in 2003 with the express intention of supporting unpaid carers young and old. To adult carers they offer, through their team of volunteers, advice, bereavement counselling, IT support and home visits. As well a one-toone befriending service they also run a number of support groups where carers can meet others in similar circumstances for discussion, advice and companionship. They run a memory café twice a month where dementia sufferers and their carers can meet in relaxed atmosphere.